The Marchington Singers is a friendly, mixed-age, mixed-ability, mixed-voice choir based in the beautiful village of Marchington in Staffordshire. Our next concert, will take place from 7:30pm on March 30th 2019 in St Nicholas Church, Abbots Bromley WS15 3BP. Tickets are £10 and include a glass of wine and nibbles! You can see more information here. We have been singing together for over 30 years, enjoying performances at a variety of local, national and international venues. 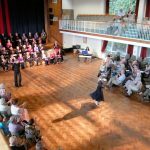 We have delighted a wide range of audiences at concerts, weddings and festivals with a wide repertoire ranging from light favourites to four-part choral works to songs from the world of entertainment. We frequently support charities through our fundraising events and activities. We take a keen interest in supporting and promoting the development of local talent, and our twice-yearly concerts have featured many guest musicians, dancers and singers of all ages, some of whom have gone on to achieve international recognition. We have also recently introduced a Student Bursary scheme for two aspiring singers up to the age of 25. We currently have around 50 singers. If you would like to join us, our weekly rehearsals are on Wednesdays at 7.30pm in Marchington Village Hall. Please contact us – you will be very welcome! This site captures no data from or about those people who have visited it, nor does it employ cookies or any other other form of data capture so is therefore not obliged by the General Data Protection Regulation 2018 to require your explicit permission to use this site.